Inspiration for visiting Provence from November-March. Les Baux de Provence on a February evening. If you follow me on Instagram you might have noticed that I’m trying to start a new hashtag #provenceinwinter because this place is honestly wonderful year-round. The area does become more sleepy after the busy summer season (thankfully!) but there’s still plenty to see, eat and do. The sky in the Camargue often has a pink tint on the horizon and in the Alpilles a dark blue behind the mountains. The air smells of wood-burning fires particularly in the Luberon where the smoke from stunning farmhouses rises in the valleys. The sheep return from their mountain retreats and take over the fields. White flowers bloom between the leafless grape vines and the winter light on the plane trees highlight their goblet shapes. When the Mistral wind is blowing it’s best to stay inside but otherwise it’s quite possible to eat outside at midday. The markets are much smaller but it’s the best markets that are year round as the tourist markets disappear during the winter months. Prices for accommodation are cheaper so you can stay even longer! Rent a villa and cook delicious stews! Here are just a few ideas to inspire your visit to Provence in winter. Come to Provence to taste expensive stinky mushrooms! 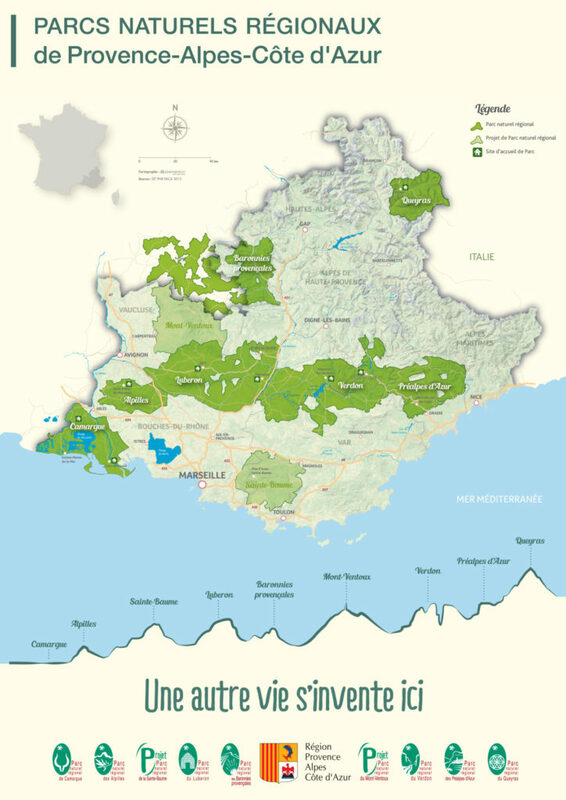 The Vaucluse is the number one producer of truffles in France. Around mid November people’s noses start twitching here in Provence in anticipation of the season’s first smelly “black diamonds”, the winter truffle. These much loved fungi are found in the wild here in Provence but are also farmed, or as farmed as they can be as their ways are still somewhat mysterious. 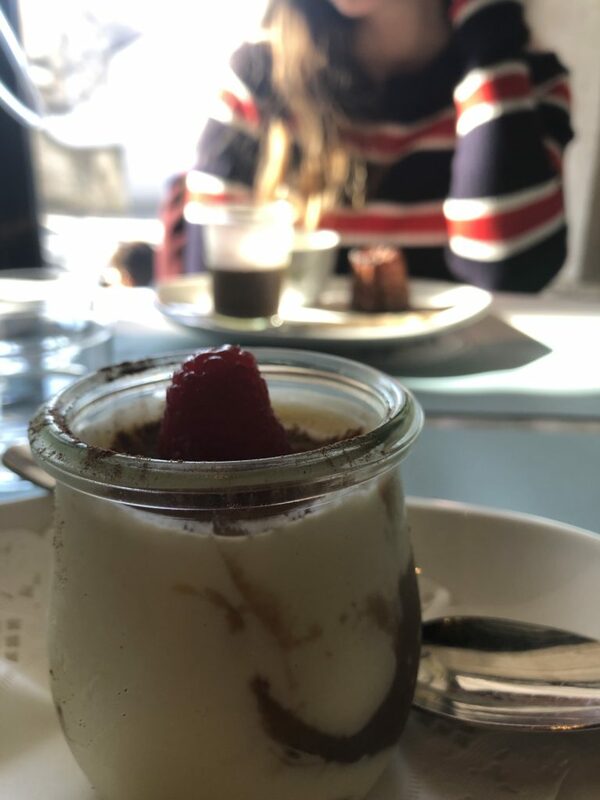 Truffles are featured on gastronomic and even bistro menus all winter long and are a particular treasure to be found at Christmas markets in Provence. 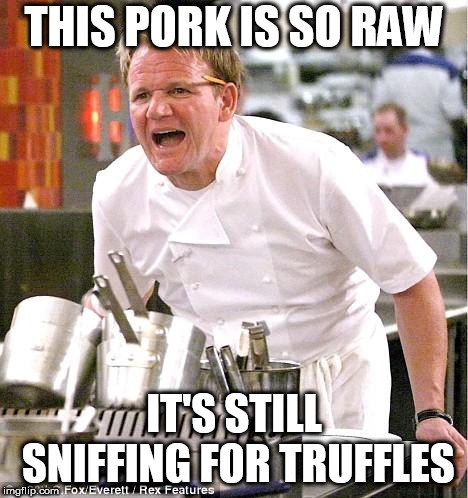 I’ve even seen truffles on the December menu for kids in school. Fantastique! 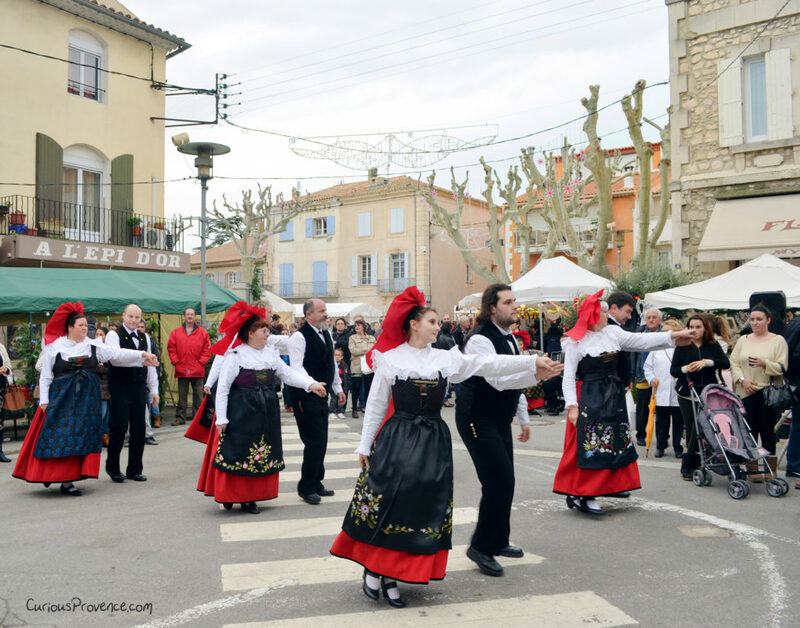 During the winter in Provence there are numerous truffle markets such as the Friday morning market in Carpentras. The Saturday morning market from November to March in Richeranches is my favourite. It’s also fun to go to the café in town after the market and see everyone comparing their purchases. This is a lovely, festive winter market. 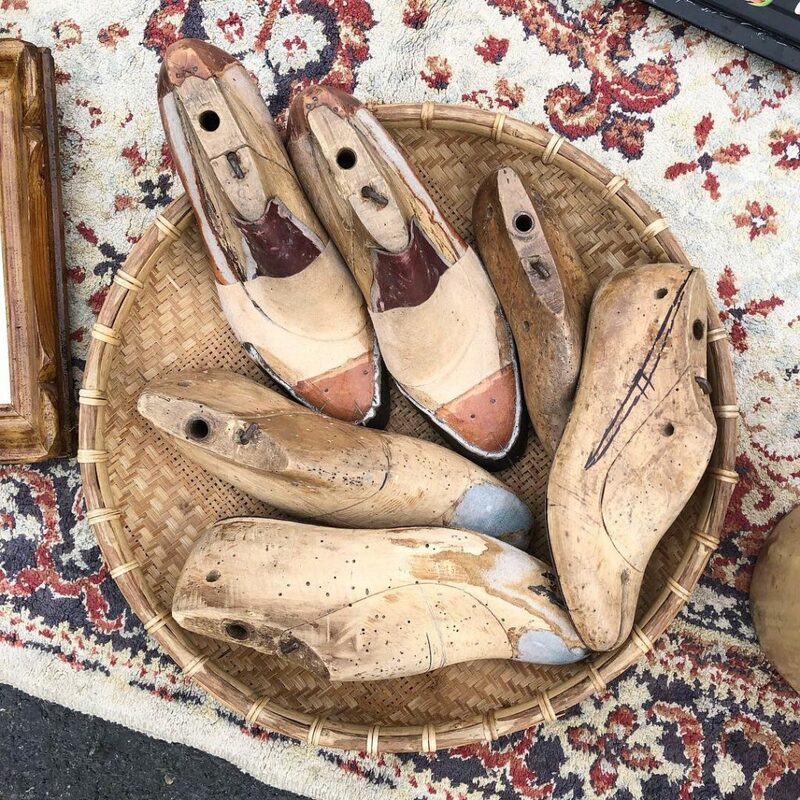 Wander the picturesque outdoor market and taste wine or book a table at the Maison de la Truffe et des vins du Luberon. Wine tasting, boutique and restaurant, book a table here to enjoy a truffle inspired menu. During the summer months keep in mind the menu focuses on the summer truffle, not the black winter truffle. The restaurant is open from April 1 – October 31st as well as the truffle market in December. 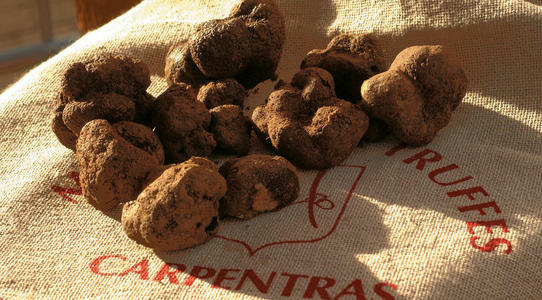 This is one of the most important truffle markets in France due to the quality of the truffles and regular inspections. A truffle market has been held here for centuries. Cour de l’ Hôtel-Dieu, Place Aristide Briand à partir de 9H00. Market for people like you and me: Office de Tourisme de 8H à 12H. Ever hear the joke about the man who gave up his wife in favour of his truffle dog? A well-trained truffle dog is worth its weight in gold, or truffles? 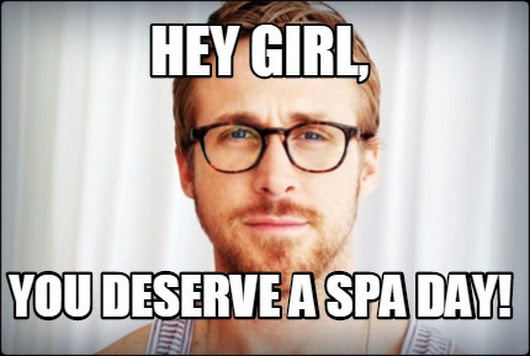 These boys are well rewarded for their hard work. Truffle hunters used to use pigs. Using pigs generally led to them losing fingers as it’s difficult to pry a pig away from a tasty truffle, especially when the truffle emits pheromones that make the pig well, how should I say…quite frisky! I was always a little dubious of this activity being offered to visitors to Provence. How could they possibly find that many truffles? I didn’t realise that most truffles are actually farmed. It’s not all old men creeping around the woods trying to avoid detection so that you don’t find their sacred spots. Although, that does still happen. Despite planting oak trees with truffle-spore inoculated roots, the exact conditions for truffle growth is still down to the mysteries of nature. The farmers take a gamble with each tree they plant; especially as the farmer has to wait years for the first truffles (if any) are produced at all. Each truffle discovery is still special. The land also has to be guarded from opportunistic locals. Summer truffles we found last year! 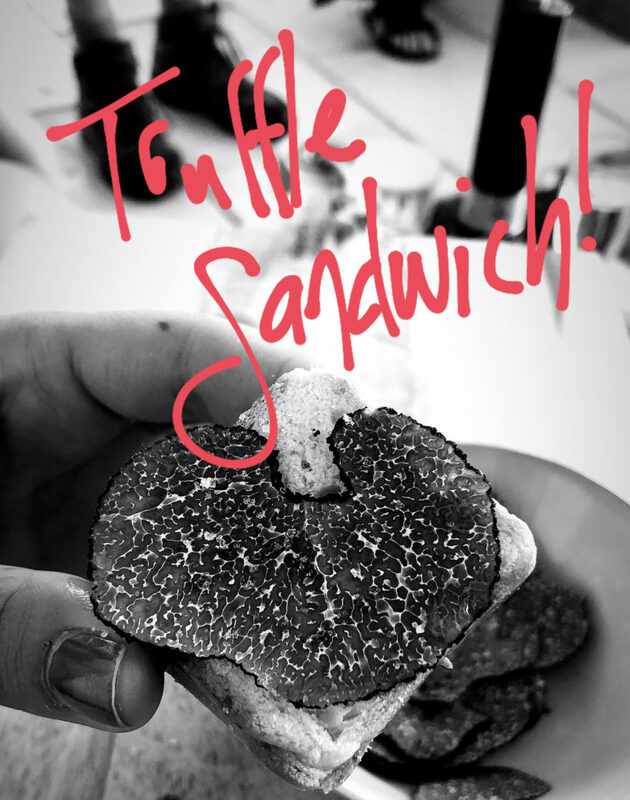 I went truffle hunting last year with Las Pastras and had an amazing time learning about the process, watching the dogs at work and then drinking Champagne and truffle tasting afterwards. All in all, not a bad afternoon at all! Be careful, Lisa has a heavy pour! (Brit translation: generous with he measures)! 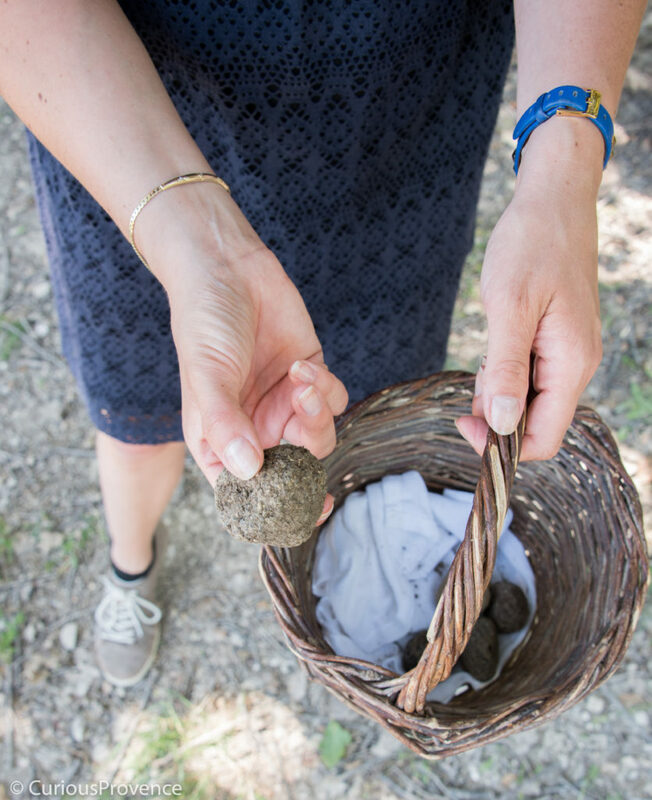 I highly recommend this activity while in Provence if you’re curious about truffles. I learned a lot. Champagne and truffle tasting. Life could be worse. If the Mistral isn’t blowing and the sun is out, winter in Provence is absolutely a pleasure. You can easily sip your coffee on a sunny café terrace and people watch. I’ve known people to even have their Christmas lunch outside! 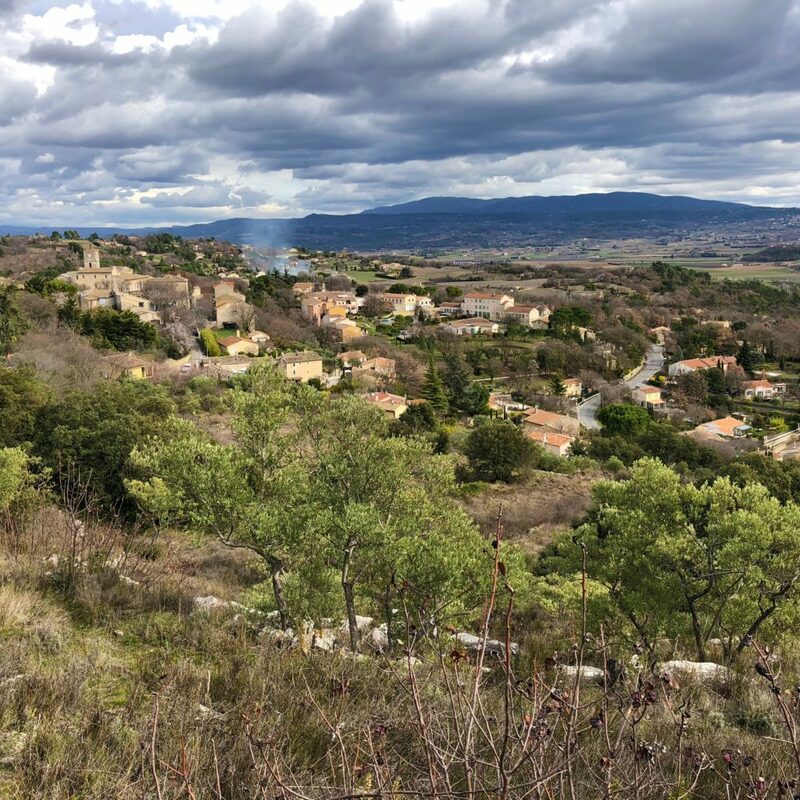 Sunny terraces aside, another wonderful thing about being in provence during the winter months is the hiking. 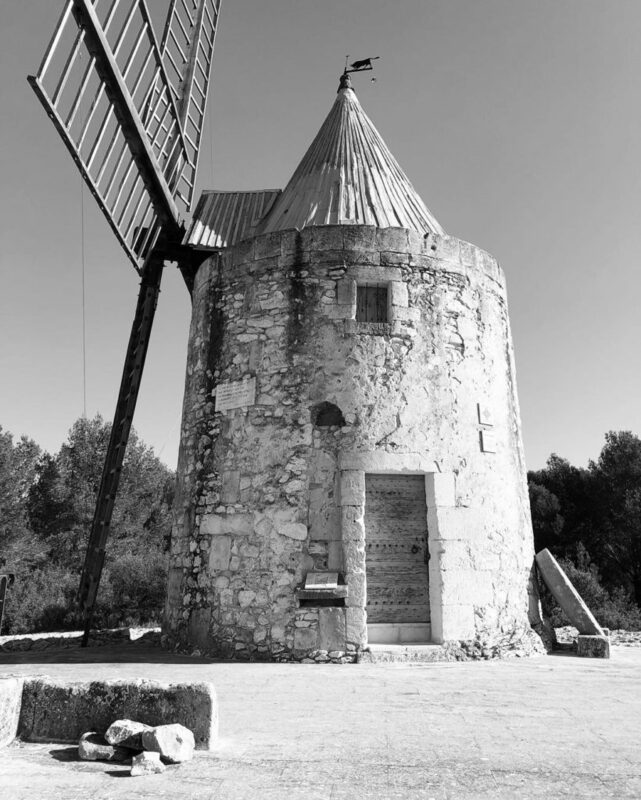 Moulin de Daudet, one of the windmills in Fontvieille, where you’ll find a windmill trail. During the hottest months it’s often against the law to hike in the national parks of the Luberon and the Alpilles due to the fire hazard. You need to check each day on their respective websites to see if hiking is possible that day. Also, who wants to hike in 35 degree heat? I certainly don’t. I can get enough sweating in by just sitting on the couch. Winter Provence Vacation photoshoots in Les Baux de Provence. We’re absolutely spoiled here in Provence to have stunning regional parks with lots of walking trails and varied scenery. 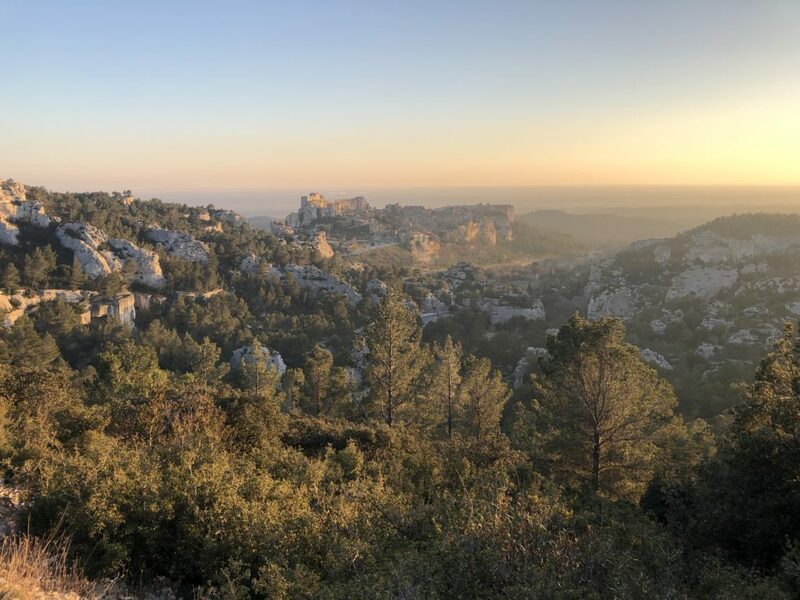 Choose from any of these: Camargue, Alpilles, Luberon, Baronnies Provençales, Verdon, Saint Baume, PréAlpes d’Azûr, the Calanques along the sea and everywhere in between! You can choose between mountains, canyons, plains, olive ochards, vineyards, ocean clifftop views, roman and pre-roman ruins, sleepy villages and so much more. You can ask for suggestions for specific walks at the local tourism office or download an app such as VisoRando which I find very helpful (my sense of direction is somewhat lacking). The app has a live map that tracks you as you go so that you can figure out the paths even if you can’t read the French directions. You’ll also find quarterly local magazines that suggest about 10 walks per season. This is helpful as the choices are overwhelming! Sea urchin and oyster festivals. There’s a celebration for every type of produce here in Provence and the winter season is certainly no exception. I have to admit that I’m not in love with sea urchins but these festivals during the month of February are a sight to behold. Imagine long communal tables and piles of various types of shellfish and prickly sea urchins. Ever attempt to open one? Oh my. 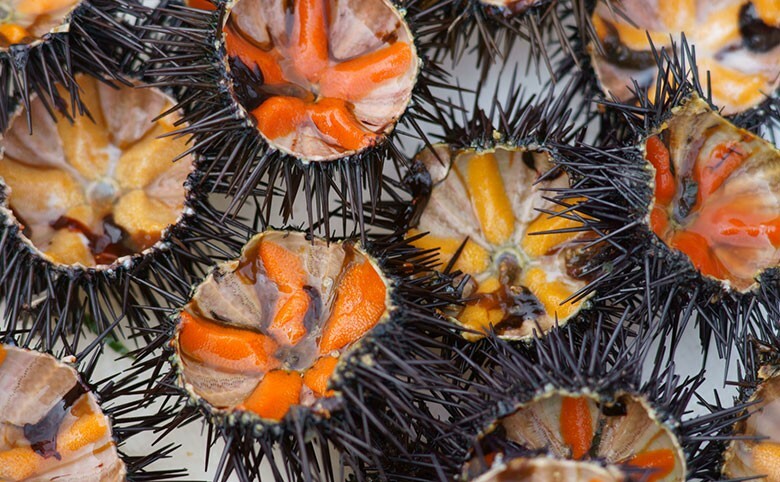 The mediterranean sea urchin is relatively small and if you haven’t tried it, then you really should. I call it the foie gras of the sea, because it tastes quite rich. Either way, gorging on seafood with lots of white wine in the sunshine will certainly warm your cockles on a February day in Provence. And many more towns on the Mediterranean! Cafés and restaurants inland also have their own oursinades too. Villeneuve-les-Avignon Saturday morning market in February. 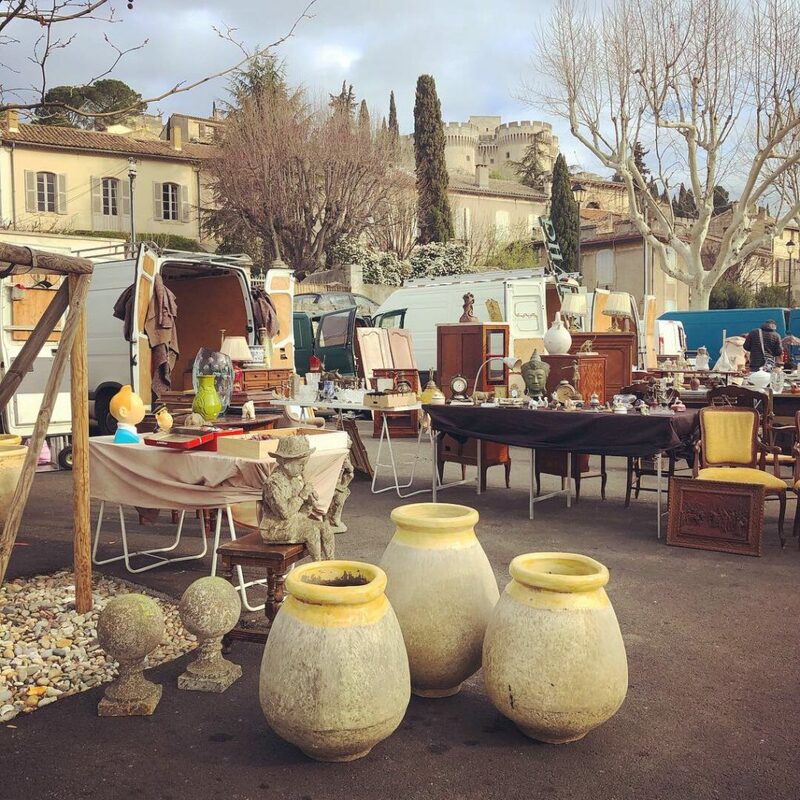 An ideal wintry Sunday morning in Provence is a meander at a flea/antiques market followed by lunch in a cozy bistro. I always end up buying some little treasure (that I don’t need!). Isle sur la Sorgue market on Sundays is one of the outdoor food markets that stays large even in the winter. Some of the antiques dealers there go on vacation in January but most of the warehouses stay open. 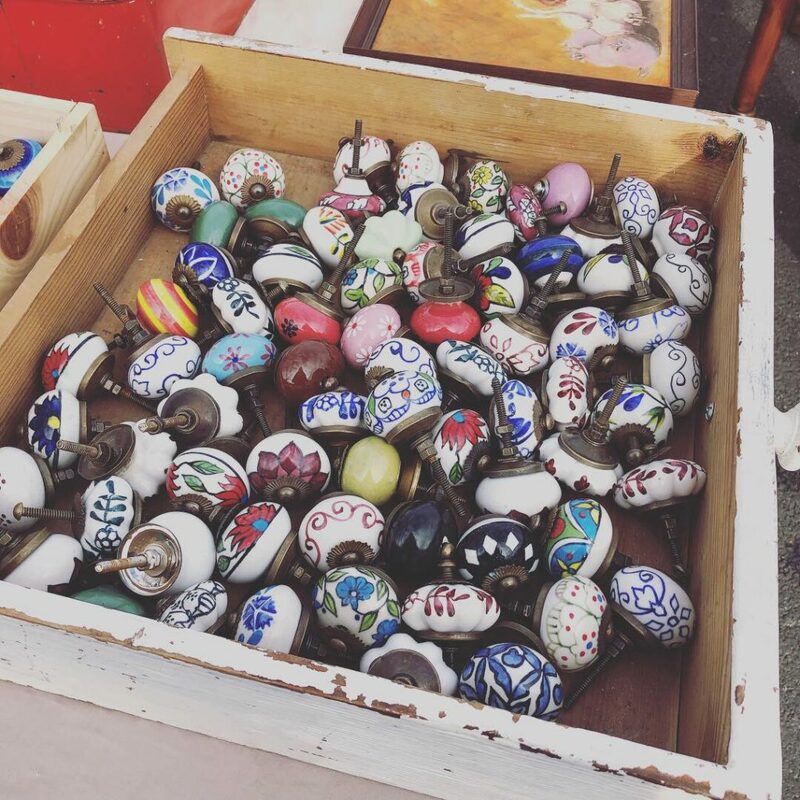 See more about antiques markets here Vide Grenier vs Brocante. Winter visit at Pont Julien close to Bonnieux in the Luberon. 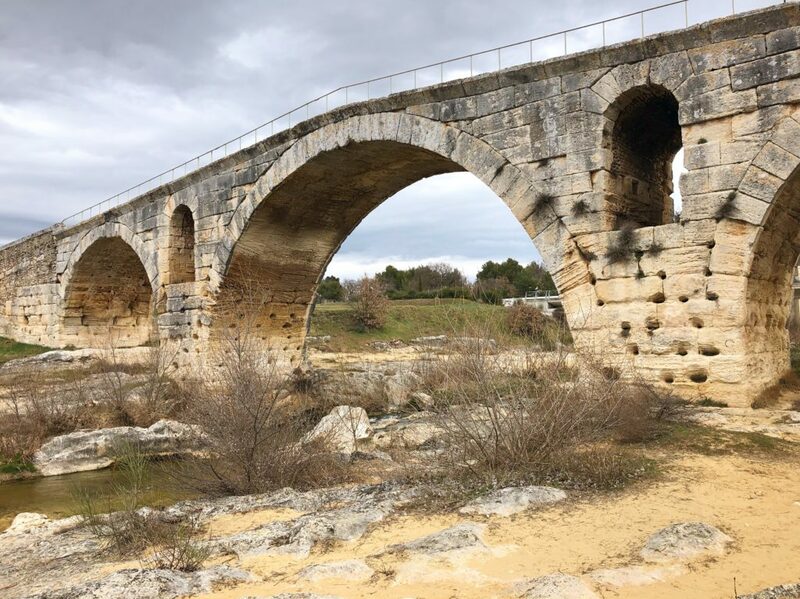 A 3rd Century Roman bridge on the Via Domitia road connecting Italy to France. Although some restaurants and even hotels close during the winter months here in Provence, the sites stay open (museums too!). Winter is a perfect time to visit historic sites as you can’t really appreciate those old stones when intense heat is radiating off them, no matter how beautifully placed by a some handsome Roman. You’ll also often have the site to yourself, which is an absolute joy. This also applies to the villages of the Luberon, many of which go into hibernation for the winter. To tie into the hiking above, there are countless smaller sites with Roman bridges, aqueducts or even ruins of pre-Roman Oppidums all over the countryside. I’m constantly discovering new places. The mosquitoes in the Camargue won’t bother you during the winter months. You can birdwatch even while on horseback! You’ll see all kids of birds in the marshlands of the Camargue including flamingoes. 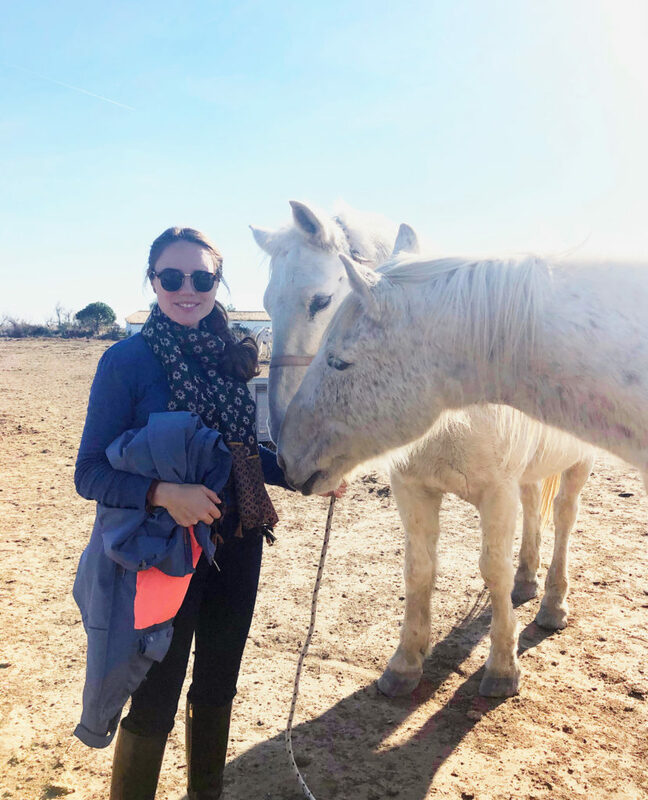 Horseback riding is popular all over the region but it is a way of life in the Camargue. The sturdy white Camargue horses, native to the region, are used to round up the wild bulls on enormous estates. Horseback ride on the beach or on the many paths in the marshlands. There are countless stables that offer rides for a fee (about 30€ for 1.5 hours). We went recently with Heidi from Lou Seden close to Saintes Maries de la Mer. She is passionate about her horses and our promenade took us by many traditional gardians houses (the residents responsible for the bulls, kind of like the French version of cowboys). If you arrive early you can brush the horses with her before your ride. Pictures taken on horseback. Not easy! *To birdwatch on your own 2 legs, see my article about the Parc Ornithologique in the Camargue. Many restaurants close for a couple weeks in January. Some close all winter. In my experience, the best restaurants are those that are open during the winter months. Wineries stay open too- there’s nothing like wine tasting on a chilly day! There are many! Each village has their own. Some are better than others. Look out for my November and December events calendars. You need to check the wind factor even before the temperature during the winter in Provence. If the Mistral is blowing, it can be up to 100km an hour and really quite unpleasant, especially if you like wearing skirts. In my experience the wettest and windiest month is November. 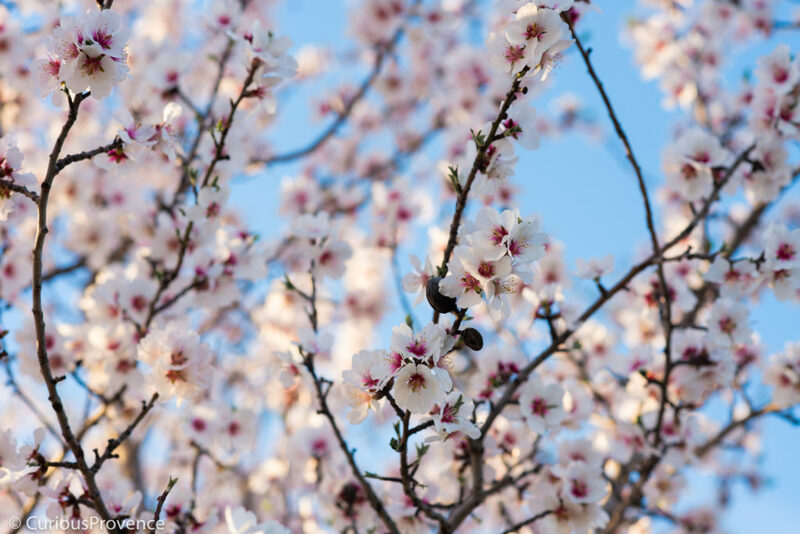 In February, you’ll be treated to mimosa and almond blossoms! Almond Blossom in February between St Remy and Maussane. Slow cooked beef stews or pot au feu and hearty Cotes du Rhône wines should be on your menu during the winter in Provence. Apples, pears and citrus fruit from Corsica are in the stores, as well as celeriac, pomegranates, leeks, beets, Jerusalem artichokes, salsify, different cabbages, truffles, chestnuts, cardoons, carrots and the crunchiest salads you’ve ever tasted are all grown in Provence. This is also the time for strong mountain cheeses. Melted perhaps? A Mont d’Or with salad and potatoes….Yum! Seafood is at it’s best such as oysters, sea urchins, tellines and more. During the festive season, make sure to try the local poultry which has a flavourful layer of yellow fat, just the way it should be. 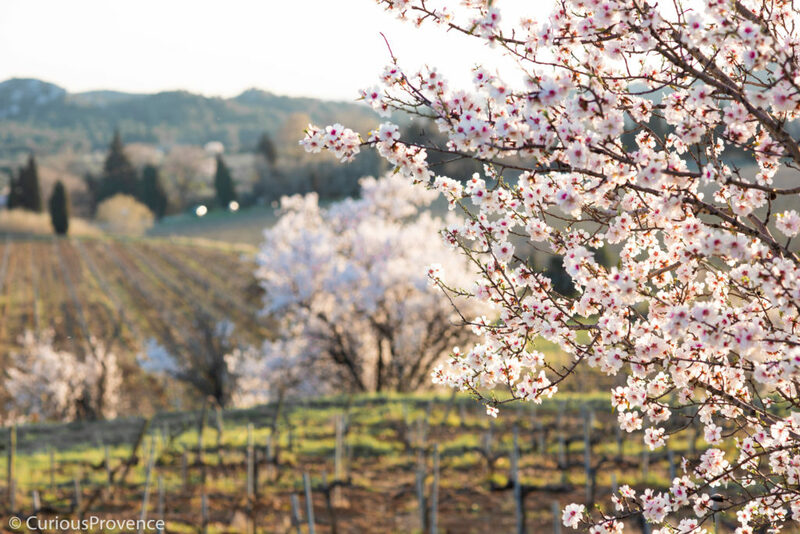 For more inspiration, see Early Spring Landscapes in Provence. The Luberon in winter by CuriousProvence. Fabulous article. I need to try any of these Tours!! Makes one want to book travel to France NOW!